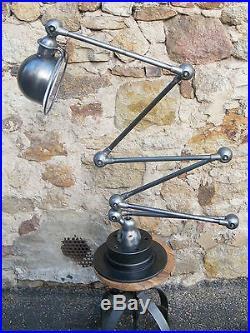 Beautiful 6 arms Jielde Lamp 1950 Vintage 100% Original French Industrial. 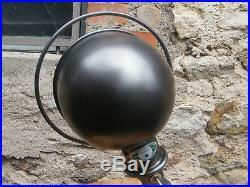 This is an AUTHENTIC 50's lamp and NOT a modern reproductions. Created by Jean-Louis Domecq in 1953. 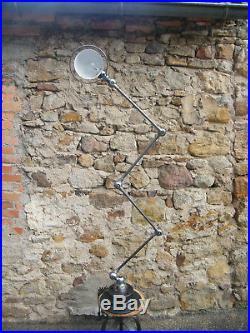 True emblem of industrial style, this lamp from the 50s was designed by an engineer who sought the perfect lamp to suit all workstations in the factory. It is very popular among fans of industrial style for its elegance, due to its pure lines, its robustness and its ability to adapt to all needs. Its timeless rawness fits perfectly in an industrial or vintage style. Made for factory work, it will withstand years without problem. Optimum illumination and adjustable thanks to its articulated arms. How has it been restored? This lamp from the 50s has first been thoroughly cleaned , disassembled and stripped to expose the metal hidden under layers of paint and rust. After polishing the lamp by hand, I treated the lamp against rust; a graphite wax was applied to the lamp to give it an elegant patina that highlights the old and authentic appearance of the object. The interior of the globe was painted white in a paint that is resistant to high temperatures in order to project a good quality light. Finally, the lamp has been fully re-electrified to match the standards of safety. It was then fixed to a steel base which gives it high stability. It's total height is. Inches when it's arms are unfold. We must not forget that in addition to its esthetic and practical qualities, the interest of this lamp is its history, which gives it its character. Small traces of its past are normal and bring her vintage charm. I can change the european electical outlet into canadian and american outlets. 100% of satisfied customers all over the world.... European Union , UK , autriche , Switzerland, Norway, Spain, Germany, Sweden, Finland, Denmark = 60 euros. Canada, ETATS UNIS = 120 euros. Australia, japan, brazil, turkey, hong kong = 120 euros Retour refusé les photos font office de descriptif. Quentin of L'Epicerie Industriel le. The item "Beautiful 6 arms Jielde Lamp 1950 Vintage 100% Original French Industrial" is in sale since Wednesday, September 5, 2018. This item is in the category "Antiques\Antique Furniture\Lamps\20th Century".design" and is located in clermont ferrand, Auvergne. This item can be shipped worldwide.